Made with 5 essential oils - extracts from angelica, lavender, sweet orange, ylang-ylang, and geranium - L'Occitane's Aromachologie range of shampoos, conditioners, and protection masks capture the highest concentration of plant benefits, allowing the products to penetrate well, work fast, and have an excellent capacity to carry natural nutrients to the hair that are essential for its vitality. I got to try the L'Occitane Aromachologie shampoo and conditioner for free thanks to a promo on the L'Occitane (US) Facebook page. One of those "like us, print coupon, get sample" things that actually did end in me getting the samples as advertised! 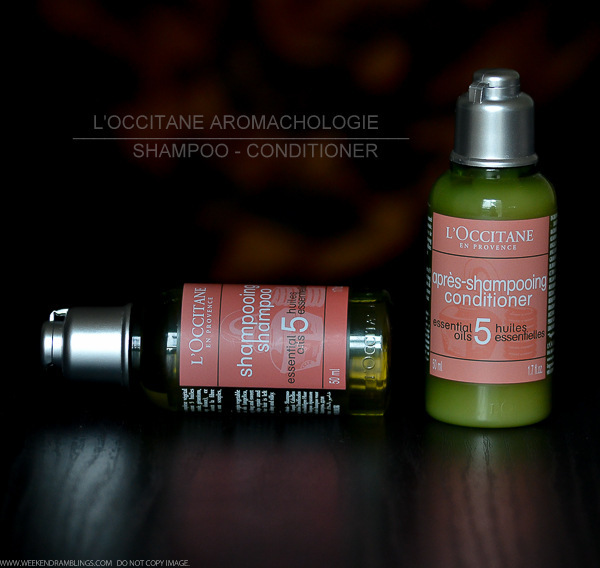 Seriously, don't get me started on the number of email and FB promos that I have signed up for and never heard from again :-| Anyway, back to the shampoo and conditioner, the L'Occitane Aromachologie haircare range claims to harness the power of 5 essential oils to help hair look and feel healthier. 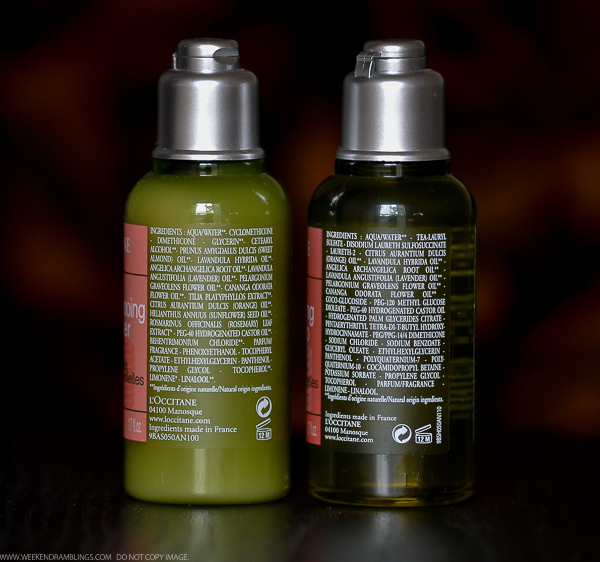 I don't really like trying out new haircare products, and while I was quite enthusiastic about picking up the L'Occitane samples, it was a while before I actually got around to trying them. 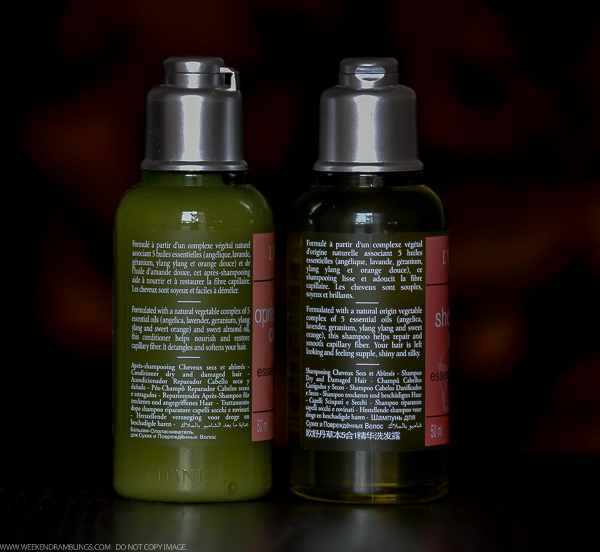 The L'Occitane Aromachologie shampoo is a clear shampoo with a bright citrusy scent to it. I do find it a little too mild, though, and on my medium-length hair (a little beyond my shoulders), I needed to use almost the entire 50 mL bottle. This is probably a good everyday shampoo for someone with finer hair. On to the L'Occitane Aromachologie Conditioner, this has a watery-runny consistency, kind of like a thin lotion. This too smells quite nice, and the combination of plant oils and -cone ingredients does leave my hair quite soft and shiny. Unlike a lot of other silicone-containing conditioners, this washes off quite easily, though, and doesn't leave my scalp feeling itchy or dry either. Between the shampoo and the conditioner, I would probably buy the conditioner. The shampoo isn't the best for my haircare routine. I used them and I loved them too. Sis got these tiny bottles kept in a hotel where she stayed ! You really can't open the cap.. only way is to cut it !! A lot of product gets wasted inside na? Shampoos you can just add some extra water and take it out I suppose, but I amn't sure what to do with the conditioner. I remember really liking this sometime ago. Especially the conditioner. The large full size package, especially the resealable one, is much easier to work with.